I'm an Application Engineer with EXAIR. We manufacture compressed air-operated products to solve problems for industrial plants. Our product line includes Vortex Tube, Air Amplifiers, Air Knives, air-operated vacuums, ionizing products for static elimination, and liquid atomizing nozzles for product cooling, coating, cleaning and painting. EXAIR is an American-owned company located in a suburb of Cincinnati, Ohio. The two methods are very simple, but still many people have questions. 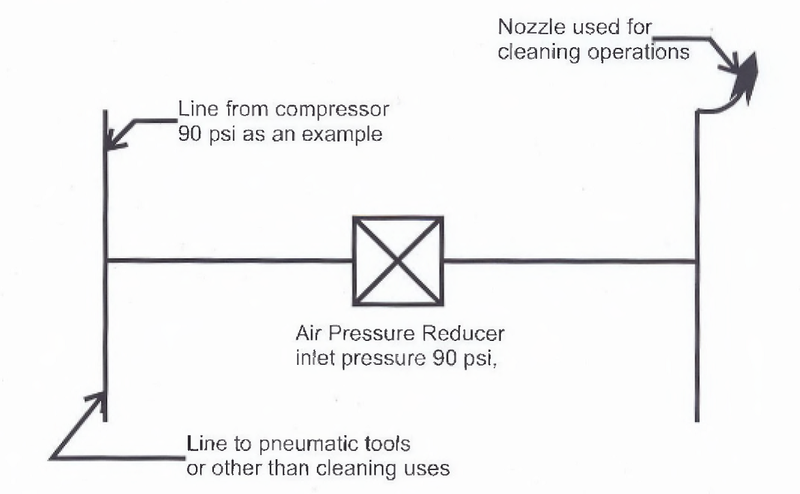 The first method (pictured below) is to regulate the line pressure from the compressor to below 30 PSIG. The second method is to install a nozzle engineered to reduce the static pressure of the nozzle to less than 30 PSIG. The first method reduces the danger by limiting the energy in the system to less than an amount which can injure a person. OSHA determined that 30 PSIG was the safe limit for the amount of pressure the human body could withstand without causing severe injury. The problem with this method is that cleaning with compressed air at 30 psig is virtually impossible. Which means at such a low pressure the operator must pass the nozzle so close to the chips and debris, he might as well use a broom or pick each piece of debris up with his fingers. This first method I will label the regulator method. The second method introduces a relief valve at the nozzle, so that an operator cannot block off all of the openings of the nozzle, and build up any static pressure on their skin. I will call this the nozzle method. Commonly and cheaply, the nozzle method is done by cross drilling a hole in an open pipe. This is a sometimes effective method for protecting employees from static pressure, but it also is great at producing a tremendous amount of noise and wasting a lot of compressed air every year. The noise produced by even a ¼ pipe with a cross drilled hole fed with 80 PSIG can easily exceed 90 dBA and consume up to 140 SCFM. The noise can be even louder, if there are burrs or rough edges from drilling out the pipe. This is also a violation of OSHA standard 29 CFR – 1910.95 (a), if the employee is not using hearing protection. To meet this OSHA standard, EXAIR’s solution is to engineer features which cannot be dead-ended into a wide variety of compressed air products. We do this a variety of ways depending on the product. For the Super Air Nozzles, we utilize multiple small orifices which are protected by raised fins. The multiple orifices offer an escape path for the air in case a single orifice is plugged. The fins protect the orifices so that no one person can block more than one orifice at a time. So if you are worried about an OSHA inspector knocking on your door, or maybe you aren’t sure if you should be worried, contact us. The Application Engineering team here will help you determine what engineered solution you need to keep those pesky fines away. Today, I’m writing one of my last regular blogs for EXAIR. Since the Professor has moved on to his higher calling, I have started working for EXAIR as a design engineer. In 2008 I was a design engineering co-op student for EXAIR. I didn’t know anything about air. I had to learn the difference between CFM (cubic feet per minute), SCFM (standard cubic feet per minute) and ACFM (actual cubic feet per minute). I had to learn that a 1/4 pipe does not measure 1/4″ anyway you measure. I found out the hard way to point the 1116 Super Air Nozzle toward the ground, because it will lift ceiling tiles in short order. EXAIR stuck with me as a co-op to allow me time to grow and learn. At the same time EXAIR continued to grow and expand as well. Once my co-op turns were over, I left EXAIR at the end of 2009. I finished my degree and got some experience outside the company. In 2013, I rejoined EXAIR as an Application Engineer. I had just learned that he was leaving EXAIR and it made me pause for a time to think about “The Professor”. He was the driving force behind the Co-op program here at EXAIR. In doing so he was sticking his neck out. I’m sure first on his mind was getting someone who could do his dirty work. No one wants to test Line Vacs in the summer. It is hot and messy work. “The Professor” wasn’t above getting dirty, but I think he wanted to be. But in hiring a Co-op, he wasn’t just making his life easier. Everyone will attest I had a lot to learn. In the first year of working with “The Professor”, he spent as much time training me as I spent producing useable material. I like to think he ultimately got more out of me than he put it in, but training Co-ops is quite an investment in time. In moving over to design engineering, I feel much more confident that I will be able to teach our new Co-ops a good way of doing their work. It is such a leg a up to have spent time in their shoes. “The Professor” ultimately never got to benefit from me working for him as a engineer. The work he put in training several Co-ops has been an excellent investment in the future, and I hope more companies follow his example. Last week, I had a customer using a competitor’s air wipes to remove water from an extrusion. These were air wipes built from UHMW blocks or similar material with a hinge and some air holes drilled in it. He had several extrusion lines, and on each of these lines he used several air wipes. The one positive of these air wipes is they used less air than EXAIR’s Air Wipes, so on paper they seem the better choice. In practice it took 5 of these Air Wipes to do the job of one EXAIR Super Air Wipe. In addition to being more effective, EXAIR Air Wipes were also less expensive and produced a lower noise level. The customer had two sizes of air wipes. The smaller version was a 1/2″ Air Wipe which used 8.3 SCFM (times 2 = 16.6 SCFM) at 80 PSIG, but it produced a noise level of 85 dBA. EXAIR Super Air Wipe, model number 2400, requires 13.9 SCFM and produces a quiet noise level of 75 dBA at 80 PSIG inlet pressure. 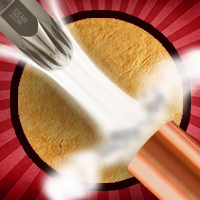 EXAIR’s air wipe is able to easily remove water from an extrusion in a single pass. The 360 degree uniform blast of air works to remove water evenly and quickly. We offer the Air Wipes in aluminum and stainless steel with a braided stainless steel air line to join the two halves of a clamshell design. The EXAIR 1/2 Air Wipe produced a much better blow off while reducing noise level by 10 dBA. 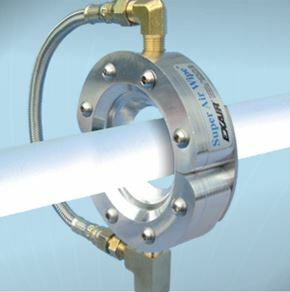 The larger version of the air wipe was a 2″ unit that used 15.3 SCFM (times 3 = 45.9 SCFM) of compressed air and created 80 dBA of noise at 80 PSIG of inlet pressure. The EXAIR 2″ Super Air Wipe, model 2402, used 29.5 SCFM and lowered the sound level to 77 dBA at 80 PSIG of inlet pressure. The EXAIR Super Air Wipes also were significantly thinner than the competitive offering which allows them to fit in tighter spaces. 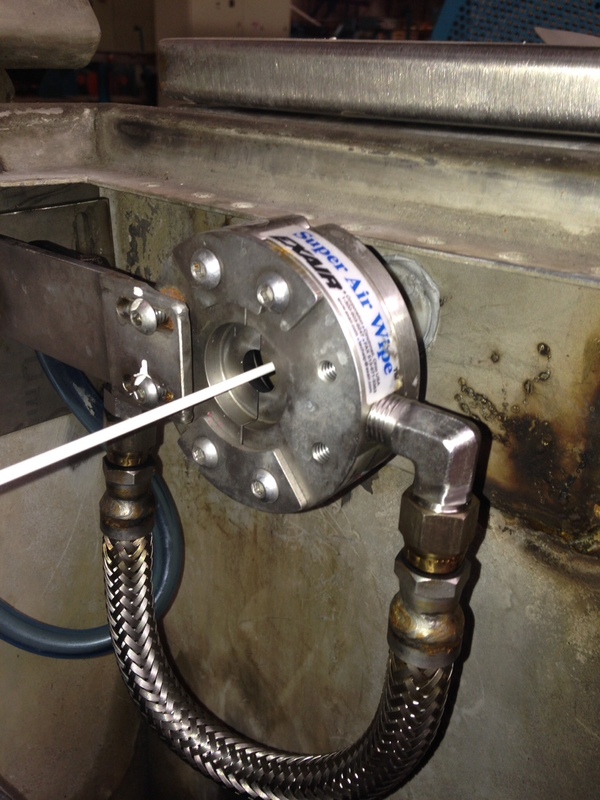 The EXAIR 2″ Air Wipe is 1.125″ in depth, the competitor’s product was more than 4″ long. By reducing the amount of the space need on the line and reducing the number of Air Wipes needed EXAIR was able to supply a better Air Wipe for their extrusion process. This morning I was chatting with my colleague Russ Bowman about taking care of kids. I was complaining about having to try and chop vegetables while holding a 1 year old in my other arm. Russ shared some perspective with me. He always took pride in what he could get done with an infant or toddler in one arm. While I was complaining, he pushed me to see what I could really get done. I thought cutting squash was pushing it. He informed me that I lack either imagination or perseverance in my dad skills. I wish his wife (or mine) had been around because, I’m pretty sure they would offer “perspective” to both of us about how much you can get done with infant in your arms. Which would be fine, Russ and I know our better halves are better than us… Thank Goodness. Otherwise, the kids would not stand a chance. The discussion reminded me of EXAIR’s foot pedal. It is like an extra hand to control your air supply. I had a customer this week that was punching 4 mm diameter plastic circles from a part. The 4 mm diameter plastic chips built up on the machine which would lead to a housekeeping nightmare. 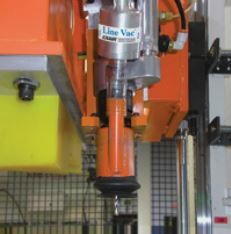 The customer installed a 3/8″ Line Vac, model 6078, to evacuate the plastic chips after each punch. The Line Vac worked great to evacuate the chips, but running it constantly required 5.6 SCFM of compressed air. To get the job done, the Line Vac only needed to run five seconds after each punch operation, and the punch operated three times every minute. Controlling the air supply to the Line Vac to only turn on when the Line Vac was needed would save 4.2 SCFM of compressed air. Picture Model 6080 Line Vac removing chips from a drill press. *Assuming 24 hour day and 250 working days per year. A foot pedal is an excellent option, when you need that third arm. 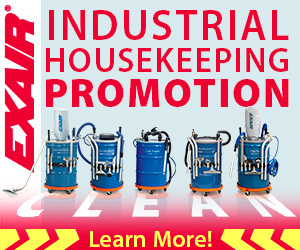 Check one out today at www.exair.com. 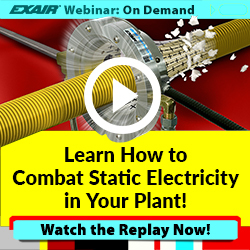 EXAIR will present a free webinar hosted by Design World September 15th, 2015 at 2 pm EDT ( UTC/GMT -4 hours). I will be presenting the webinar about Intelligent Compressed Air Products. What do we mean by Intelligent Products? We are referencing nozzles that are quiet, safe, and efficient. They are engineered and manufactured to improve efficiency and limit compressed air use by entraining ambient air. The smooth lines of these nozzles produce laminar flow that reduces wind shear creating a powerful quiet blow off. The focus of the webinar will be to quantify the cost of homemade blow offs and the return on investment of upgrading these simple installations to an engineered solution. We will base our calculations on a 20 HP Air Compressor, an 1100 Super Air Nozzle, a 1/4 Open Copper tube, and $0.08 per kWH electricity cost. In addition to the cost of compressed air, we will cover two safety issues. First, we will cover dead end pressure. OSHA standard 29 CFR 1910.242(b) limits the dead end pressure to less than 30 PSIG. We will talk about what type of nozzles do not comply with this regulation, and how engineered nozzles are designed to meet this requirement. Second, we will talk about the noise exposure standard and the effects noise will have on your facility. The main focus of the presentation will be cost of compressed air blow offs, noise, and important OSHA standards for compressed air. We will also touch on a variety of other compressed air topics. The presentation will be sponsored by EXAIR with 31 years of end-use compressed air product manufacturing and application experience. On July 25th, EXAIR products received some attention from Formula 1 fans. During the qualifying runs for the Hungarian Grand Prix, EXAIR Adjustable Air Amplifiers were used by at least two different drivers to cool down during adjustments in the pits. 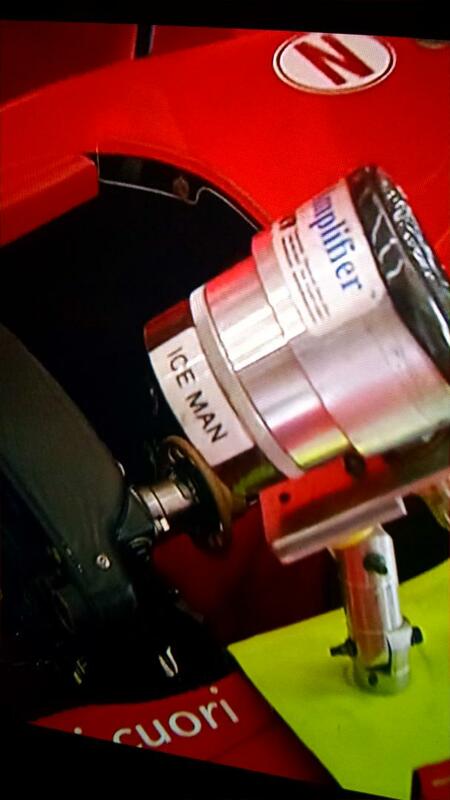 We first saw Kimi Räikkönen aka The Ice Man cooling off with an Adjustable Air Amplifier. 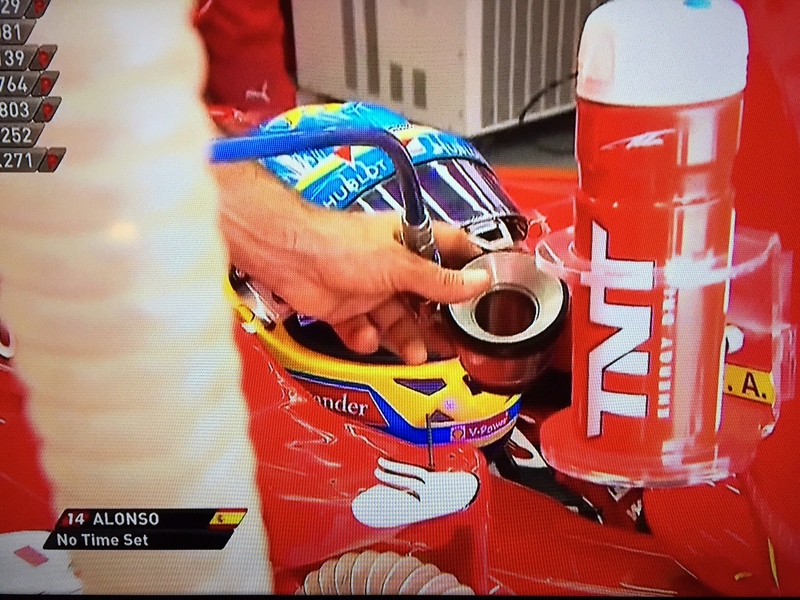 We also receive a photo of Fernando Alonso using an air amplifier in the same application. EXAIR’s Air Amplifiers use a small amount of compressed air to produce air flows amplified 24 times the compressed air flow used. This can create flows that reveal Formula 1 cars in speed (up to 250 MPH). Force and flow for the Adjustable Air Amplifier is changed by turning the exhaust end (with knurled lockring loose) to open or close the continuous air gap. When the air amplifier meets the flow required for your application, the knurled locking ring may be tightened to lock the flow. We have supplied products to a number of racing teams throughout the world over the years, but we did not know exactly how they were being used. To see these two great drivers using our product one is led to believe we may be the industry standard in yet another field. For those that may not know Räikkönen won the 2007 Formula One Championship with Ferrari. Alonso has won the championship twice(2005, 2006). It is reasonable to inquire, how many others in the field are using EXAIR’s Air Amplifiers as well?